With the recent announcement that Denis Villeneuve will indeed direct the upcoming Dune movie (source) i started my reread of the whole series (i am almost done with book one) and was surprised to not find any thread for it on TL. Dune is a 1965 epic science fiction novel by American author Frank Herbert, originally published as two separate serials in Analog magazine. It tied with Roger Zelazny's This Immortal for the Hugo Award in 1966, and it won the inaugural Nebula Award for Best Novel. It is the first installment of the Dune saga, and in 2003 was cited as the world's best-selling science fiction novel. 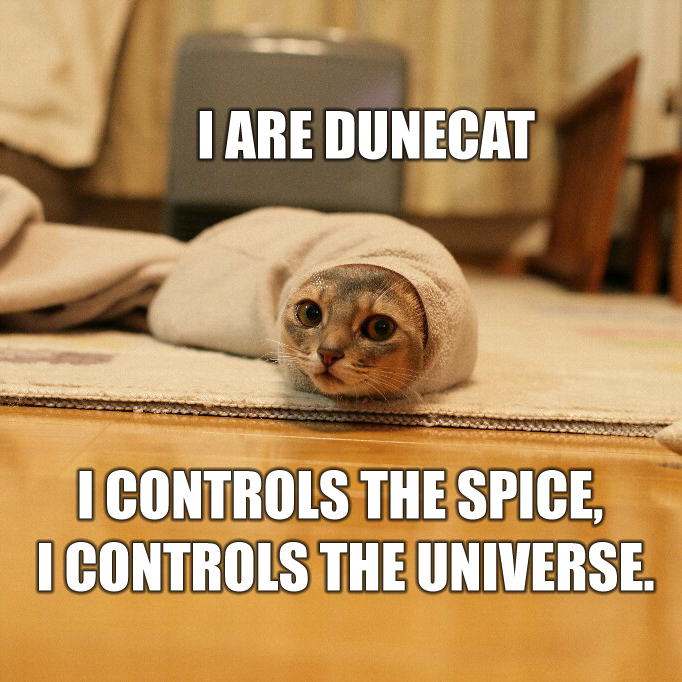 I really think everybody who is vaguely into reading should experience the DUNE series. It's probably one of the very best scifi/fantasy/whatever you wanna call it series ever. Just read it. Not sure how we should act about spoilers, there is a movie upcoming, there will be new readers (i hope), etc. I think for a start spoiler tags would be a good way to deal with it. Is there a certain point where I should stop reading them? I've heard the series is prolific (and ruined sci-fi*) but also that the author didn't write every single book. *because every subsequent sci-fi book became enormous. My told me that only the first three are worth reading (I don't think he read past the 6th or maybe not even that far), but then someone else told me that the 4th book is the best. I still haven't read past the 3rd, but I intend to read at least the 4th to 6th, though I will have to read the first 3 again to remember names and such. I guess to clarify what I mean: the Dune books didn't just build a narrative, they built an entire universe around it, which is apparently different from what a lot of other sci-fi authors did. It's just that the styles of the books change a bit, the first is the most approachable which is why it's the most popular in general. So if you really don't want to invest a lot it might be fine to just read that, it kinda stands on its own. It's incredibly in depth and he doesn't spoonfeed any information really. So you kinda get thrown in and have to figure it out as you go. It's kinda fantasy like (which always does a lot of worldbuilding) but it actually has depth to it as well, not just arbitrary details. So there really is no way that the new movie will be able to delve into everything, but i am hopeful that denis villeneuve will still produce a great work on its own. I'll probably read the first 6 at most then, I find it's hard to enjoy a book if its quality of writing is significantly lower than the previous one in its installment. The first three make up one story. Frank Herbert wrote parts of 2 and 3 before he had finished 1. I tend to think of it like an unbalanced symmetry because he never finished book 7, but 1-3 is the first part, book 4 is the fulcrum, and 5-6 is the second part. Book 4, God Emperor, is the best one for me, and books 5 and 6 are a bit disappointing compared to the first 4, but they add in detail that makes the first 4 feel more full. I generally recommend the first 4 strongly, and if enjoyed then 5 and 6. But nothing by his son. Supposedly he has Frank Herbert's notes, but from reading enough interviews I know that he also made up a ton of crap for his books that were not in Frank Herberts notes, and a comparison will also show contradictions and points where it becomes very clear his son did not understand the originals. Avoid at all costs. The books Brian Herbert and Kevin Anderson wrote aren't that bad for the most part. They are rather mediocre books, but not nearly as awful as you'd think from listening to Dune fans. Dune fans mostly hate them since they are seen as exploiting and tarnishing Frank Herbert's legacy, but the books' contents themselves are middling. I wouldn't recommend them, but I don't think they are horrible either. The problem is that Frank's books are absolutely incredible. If you then write stuff which is kinda cool but has none of the depth of the original dune work then fans might get upset. Especially with the way Brian behaves. While it has been a few years since the last time I've reread them, I can only echo the sentiments in this thread that say the 6 are worth reading. 5 and 6 are after a huge time skip but still feel Dune-like (first 3). 4th book is a being of its own, really. Dune really is a sci-fi classic and staple, much like Assimov's Foundation Series. I haven't read anything by his Frank Herbert's son, so I can't comment on those works. I don't disagree, but fans sometimes act like the stuff Brian wrote is as bad as The Eye of Argon. In a vacuum the books are neither particularly good nor especially bad. I would agree with that. But it's not a vacuum and his general behavior is abysmal as well. But yeah don't make this a bash thread of Brian. Let's see how good it is first. Can't be worse than the 1984 version. It's good but a bit heavy and slow, I don't know how to word it in English. A good comparison could be Tolkien, who could get away with it because he actually wrote very well, better than Herbert. I would have prefered a cleaner and simpler style. Oh yeah it will be tough to make a good DUNE movie, but Villeneuve seems to be a fan and his movies so far have been excellent so i like the chance. Huge Dune fan here, have read the original upwards of 10 times, and the full series at least 4 or 5. I haven't touched Brian Herberts books further than the first page of one of his 'prequels'. I read his description of the younger Baron Harkonnen as a lithe and supple young man and put the book down. Not sure what to expect from the movie. It is such a hard experience to capture on film. Everything is in the nuance. It has such a rich background and behind the narrative cultural tapestry that I think even the most talented director would find difficult to represent in a normal 90minute-ish production. On the other hand, of course I am excited for more Dune material. However, I doubt that anything can top the 'movie' that Frank Herbert already implanted in my head. On a semi-related note, Roger Zelazny wrote my second favourite series of all time: 'The Chronicles of Amber' which is another epic (unfortunately, he also died after completing the 10th book, having planned the series for a full 15 (they are quite short individually so don't be scared)). Although easier to access and understand than Dune, the characters, writing style are extremely charismatic. Also, on the Tolkein vs Herbert debate, I find Tolkein to be a very boring writer. He created an amazing world, but it is serious effort to get through his books. Herbert however keeps me entertained and wanting more from each page. It's less for me about his writing ability, and more about his putting out "Book 7" and pretending like everything came from his dad's notes. It very clearly did not come from his dad's notes, and he had no business finishing it. I don't care about the prequel series, I just hate how generic he turned the story in his Book 7. He fucked with the story and missed the point. About the movie: Well it's impossible to include everything, not even a HBO style tv series would be able to do that really. But i have some faith in Denis Villeneuve that he still will make a great movie which includes some important parts as well as it can, that he will give us great scenes and worldbuilding and that it brings DUNE a bit into the spotlight because i think it should be. Ofc it's complex work but i bet quite a lot of people would still enjoy it and they simply don't know about it. +1 for reading all 6 books. 1-3 have more interesting characters while 4-6 have very interesting ideas in them. There is a 1984 David Lynch movie that was packed with talent but didn't quite live up to its own expectations. A 2000/2003 set of TV miniseries by the Sci-Fi Channel was also made (Part 1, Part 2). Also of interest is the documentary Jodorowsky's Dune about a very interesting Dune film that was never made. There have been several Dune computer games, but all are too old to recommend now. However, of note is Dune II from Westwood Studios, which was a pioneering RTS game that popularised the genre. Dune II is to RTS games as Wolfenstein 3D is to FPS games. The Dune universe feels a lot like a fantasy setting stylistically but never hides its sci-fi elements and big ideas. I think this is a big part of why it is so popular.